The biotic resistance hypothesis provides one of several explanations for the limited biological recovery of streams recovering chemically from acidification. The hypothesis proposes that acidification has changed the presence, abundance and interactions among species in acidified streams to the extent that acid-sensitive colonists cannot re-invade even where acidity has ameliorated. As a first step in testing for biotic resistance in streams, we conducted a field experiment to determine whether the success (growth rate) of acid-sensitive recolonists (mayfly nymphs, Baetis rhodani) is reduced by competition with abundant acid-tolerant residents (stonefly nymphs, Leuctra inermis) in a chemically recovering Welsh stream (UK). Gut contents analysis revealed a marked overlap in resource use between the two species. However, when Baetis was exposed to several (0, 0.25, 0.5 and 1 times ambient) densities of its putative competitor, Leuctra, growth rates of the colonist were not affected by the residents at any of the densities tested. These results do not support the hypothesis that resident species constrain colonist populations by affecting growth rates through competition for limited resources or interference. Further work is required to assess whether independent and/or interactive ecological effects of other common residents might affect colonists in ecosystems recovering from past stressors. Declining acid deposition across the northern hemisphere over recent decades has led to widespread improvements in the water quality of formerly acidified surface waters (Battarbee et al., 2014; Monteith et al., 2014). In some areas, mitigation programmes have attempted to restore water quality by applying calcium carbonate to catchments or river channels through ‘liming’ (McKie et al., 2006), yet despite continuing de-acidification in many river systems, there has been only partial biological recovery (e.g. Ormerod & Durance, 2009; Battarbee et al., 2014). Several hypotheses have been proposed to explain the failure of acid-sensitive species to recolonise watercourses that are apparently recovering chemically (Yan et al., 2003). These hypotheses, which are not necessarily mutually exclusive, include (1) dispersal limitation, (2) abiotic resistance, (3) resource limitation and (4) biotic resistance (e.g. Ledger & Hildrew, 2005; Murphy et al., 2014). Dispersal limitation could be an important consideration for less mobile aquatic organisms (e.g. Gastropoda) but recent research indicates it is unlikely to be a major factor constraining recolonisation of insects with highly dispersible winged adults (Masters et al., 2007; Murphy et al., 2014). Abiotic resistance may also limit the persistence of recolonists where continued acid episodicity arises after heavy rainfall or snowmelt (Lepori et al., 2003; Kowalik & Ormerod, 2006), but episodes may not be a straightforward explanation for limited biological recovery where acidity is ameliorating (Monteith et al., 2014). Resource limitation may occur where the low quantity and or quality of available food constrains recovery (Ledger & Hildrew, 2001a, b; Thomsen & Friberg, 2002). For example, the absence of herbivorous invertebrates in acid streams has been attributed to the impoverished nature of the biofilms at these sites (e.g. Townsend et al,. 1983; Dangles & Guérold, 2000). Whilst much evidence points to marked changes at acidified sites in the taxonomic composition of algal assemblages (Hirst et al., 2004; Bray et al., 2008), consequent effects on food quality/quantity remain uncertain (Ledger & Hildrew, 2001a, b; Murphy et al., 2014). Evidence for biotic resistance to recovery has been found in lakes (e.g. Vinebrooke et al., 2003), but the hypothesis has received little consideration in rivers and streams (but see Ledger & Hildrew, 2005; Layer et al., 2013). For instance, we do not know whether changes in the presence and abundance of species, and biotic interactions, which occur under acid conditions in turn influence the invasibility of riverine communities as acidity ameliorates (Ledger & Hildrew, 2005; Murphy et al., 2014). Acidification leads to major shifts in the presence and abundance of species across the food web. Changes in assemblage structure and resulting shifts in the strength and number of species interactions may impart a degree of biotic resistance to the re-establishment of acid-sensitive populations once water quality is restored. ‘Community closure’ (sensu Lundberg et al., 2000) may arise where species loss occurs unevenly across functional groups, altering trophic structure (Hildrew et al., 1984; Planas, 1996). Evidence of ‘competitive resistance’ has been found in acidified lake communities (e.g. Keller & Yan, 1998; Holt & Yan, 2003; Vinebrooke et al., 2003; Frost et al., 2006), where delayed recovery of algal and zooplankton communities following chemical restoration has been attributed to competition with persistent acid-tolerant species, but support in streams remains circumstantial. In this paper, we examine the potential for biotic resistance to recovery within the benthic macroinvertebrate community of a chemically recovering stream in mid-Wales, UK. Acidified streams in the catchments of the River Wye are improving chemically, both through declining acid deposition and restoration projects (liming), but to date evidence for biological recovery is scarce, with limited persistence of many acid-sensitive invertebrates, especially mayflies (e.g. Bradley & Ormerod, 2002; Ormerod & Durance, 2009). One of the untested mechanisms of community resistance to reinvasion in streams is competition with residents, and it could be that changes in species abundances and interactions occurring as streams acidified place tight constraints upon the subsequent return of sensitive species when acidity ameliorates (Ledger & Hildrew, 2005; Layer et al., 2013). Stoneflies occur commonly in upland streams and abundances can increase dramatically under high acidity, reflecting compensatory dynamics arising as resources are released by species deletions (Ledger & Hildrew, 2005; Frost et al., 2006; Tixier et al., 2012). We have shown elsewhere that species within the order feed (Ledger & Hildrew, 2000a) and grow (Ledger & Hildrew, 2001a, b) on the sparse algal layers of impoverished acid streams, and it could be that as acidity declines, recolonists such as baetid mayflies face competition with these highly abundant, herbivorous residents. Stoneflies can depress the abundance of algal resources available on stones (Ledger & Hildrew, 2000b) and where they are abundant could limit the availability of algal food for new colonists. As a first step in testing for biotic resistance in streams, we examined the effect of a numerically dominant acid-tolerant resident (Plecoptera: Leuctra inermis Kempny, 1899) on the success (growth) of a widespread, acid-sensitive and early recolonist (Ephemeroptera: Baetis rhodani Pictet, 1845) that has so far shown limited persistence in de-acidifying streams (e.g. Bradley & Ormerod, 2002). Several field experiments have demonstrated the potential for competition within the stoneflies (e.g. Ledger & Hildrew, 2000a, b) and mayflies (e.g. Kohler, 1992) characteristic of upland streams, but the extent to which competition occurs between these groups has not been tested within the context of acidification. Specifically, we assessed the degree of resource overlap between Leuctra inermis and Baetis rhodani and, using a field experiment, tested the hypothesis that the growth rate of a recolonist, Baetis, could be affected by Leuctra, its putative competitor. Consistent with the biotic resistance hypothesis, we predicted that the growth of Baetis would be constrained by Leuctra and that mayfly growth rates would decrease with the increasing abundance of the stonefly resident. Research was conducted in a reach of the upper River Wye (site WY34, 52.414772N, −3.659245W) in August 2007. Catchment land use was a combination of pasture, with acid grassland and forests of exotic species such as Picea sitchensis (Bong.) Carrière (Forestry Commission, 2002). The site has been monitored routinely as part of long-term research in the Wye and Usk catchments (see Lewis et al., 2007; Frame, 2010). In July 2003, hydrological source areas of the Wye were treated with limestone as part of a large-scale mitigation programme designed to improve water quality and ecological status of sites impacted by acidification (Lewis et al., 2007). Although the main channel of the river was not limed directly, it was subject to the cumulative influence of lime-treated tributaries and was characterised by stable pH during the summer months. River water at the study site was moderately acidic (minimum pH 5.7, mean pH 6.0, maximum pH 6.3 for 2003–2006; study pH 6.1 August 2007) and nutrient poor (mean dissolved calcium 2 mg l−1, nitrate 0.4 mg l−1, phosphate 0.012 mg l−1 for 2003–2006), with relatively low mean dissolved aluminium concentrations (maximum 0.080 mg l−1, minimum 0.009 mg l−1, mean 0.032 mg l−1 2003–2006, Frame, 2010). Research was conducted in a physically unstable (Pfankuch index = 73; Pfankuch, 1975) stony riffle dominated by cobbles and gravel where the river was 10 m wide and 0.5 m deep (Frame, 2010). In the UK Baetis rhodani is typically bivoltine, with a summer generation emerging between August and February and an overwintering generation on the wing between March and July (Elliott et al., 1988). The acid-tolerant stonefly Leuctra inermis is a univoltine primary consumer with an overwintering generation in which adults are on the wing from April to September and at the study site, nymphs were present all year (Frame, 2010). Baetis colonists potentially co-occur with resident Leuctra across their aquatic life cycle, from neonate to late instar nymphs, and competition could occur across these life stages. For B. rhodani, repopulation of chemically recovering streams is likely to be by dispersal of winged adults from neighbouring catchments (Masters et al., 2007), although drift from less acid upstream reaches is also possible. As neonate colonists hatching from eggs grow and redistribute, the success of this initially sparse population of nymphs is potentially influenced by interactions with acid-tolerant residents, including stoneflies and other macroinvertebrates, over several months. Here, we report the results of an experiment to test the interspecific competitive effect of Leuctra residents on Baetis in mid-summer when nymphs are maturing, overwintering generations of Baetis and Leuctra are the dominant life stage in the stream, and the likelihood of confounding acid episodes is at its lowest. Our experiment therefore represents a snapshot of the interactions occurring between the two species later in their life cycles as the nymphs develop. An additive experimental design (Inouye, 2001) tested the effect of interspecific competition from resident Leuctra inermis on the performance (growth rate) of a focal colonist species, Baetis rhodani, using in-stream enclosures (plastic containers with lids, 15 cm length × 10 cm width × 5 cm height). Seven treatments were established, representing various density combinations of Baetis and Leuctra (Table 1). In four treatments, the number of B. rhodani individuals was held constant (5 individuals per enclosure, equivalent to 10% of densities in reference streams, consistent with sparse populations recolonising restored habitats) and exposed to varying densities (0, 25, 50 and 100% ambient density) of its putative competitor, L. inermis; treatments 1–4, Table 1). The maximum ambient density of the resident Leuctra inermis (1333 m−2) was determined from Surber samples (0.0625 m2, 250 µm mesh net) collected from 30 sites in the Wye catchment (Frame, 2010). In two further treatments, each species was held in the absence of the other (at equivalent densities, 20 individuals per enclosure) to compare growth rates and assess the potential impact of each species on algal resources (treatment 5–6, Table 1). Finally in an ungrazed control, algal resources were enclosed without animals (treatment 7, Table 1). Enclosures were fully submerged and placed longitudinally to the flow in blocks of seven in well-lit stony riffles for a period of 23 days. Blocks were replicated seven times (i.e. a total of 49 enclosures), resulting in a 7 × 7 randomised block design. The side walls of the enclosures contained six circular apertures (each 4 cm diameter) of 300 µm mesh. The mesh size allowed water flow through enclosures but prevented departure or arrival of macroinvertebrates. The mesh walls were cleaned weekly during the experiment to reduce clogging. Enclosures were placed in areas of moderately high water velocity, thereby offsetting flow reductions caused by the mesh (cf. Ledger & Hildrew, 2000a, b), and secured to the stream bed using metal stakes. Two rinsed biofilm-coated cobbles from the same stretch of river were placed into each cage, together with clean sand. Biofilms were characterised by diatoms Achnanthidium minutissimum (Kützing) Czarnecki, Fragilaria cf. capucina var. gracilis and Eunotia exigua (Bréb. ex Kütz.) (I. Juttner, pers. comm.). Nymphs of Baetis rhodani and Leuctra inermis were collected from riffles downstream of the experimental area using a hand net (250 µm mesh) and were placed in the enclosures. For each species, nymphs of approximately equal size (mean body length ± SE: Baetis 4.8 ± 0.1 mm, Leuctra 7.4 ± 0.1 mm) were selected for use in the experiment. Nymphs from the pool of individuals collected from the river were subsampled initially (day 0) for growth determination (100 Baetis, 100 Leuctra) and gut content analysis (12 Baetis, 12 Leuctra). At the end of the experiment, all nymphs recovered from enclosures were collected and preserved in 70% industrial methylated spirit and subsequently processed in the laboratory. Water temperature (weekly spot samples) during the experiment ranged from 13 to 17°C. At the end of the experiment, algal biofilm was scraped from the upper surfaces of two cobbles in each enclosure using a toothbrush, washed into separate scintillation vials with filtered stream water, and frozen immediately in the dark. The scrubbed surface of each cobble was carefully traced onto an acetate sheet and the area (cm2) subsequently determined from the mass of the tracings (Ledger & Hildrew, 1998). The biofilm samples were later defrosted in the laboratory and made up to 24 ml with water. Estimates of ash-free dry mass (AFDM) were made by placing aliquots of biofilm slurry (5–10 ml) in crucibles for ashing at 500°C for 4 h. AFDM was estimated as the difference between oven-dried (80°C) and ashed crucibles (Ledger & Hildrew, 1998). The diet of B. rhodani and L. inermis was determined to establish the extent of resource overlap between the two species collected from the river (n = 12 individuals for each taxon) and experimental enclosures (n = 12). Nymphs were rinsed in deionised water to remove preservative, and the contents of the fore-gut teased onto a glass slide, enclosed by a coverslip, and examined under a stereoscopic microscope (Zenith STZ-4500) (Ledger & Hildrew, 2000a, b; Ledger et al., 2002). The contents were then dispersed into a drop of deionised water using forceps. Prepared slides were examined under a compound microscope (Nikon Alphaphot YS2-T), and particles present in the gut contents were assigned to one of five categories, namely diatoms, filamentous green algae, coccoid green algae, amorphous detritus and inorganic debris (after Ledger & Hildrew, 2000a, b; Ledger et al., 2002). Particle areas were calculated for each nymph by multiplying the number of particles of each type in the field of view by the mean area of each particle type, calculated from 50 randomly selected particles (Ledger & Hildrew, 2000a, b). where t is the duration of the experiment in days (Ledger & Winterbourn, 2000; Burrell & Ledger, 2003). One-way ANOVA was used to test the effect of L. inermis density on the growth rate of B. rhodani (treatments 1–4, Table 1) and compare mean algal biomass (as ash-free dry mass per cm2) across the seven experimental treatments. Data were tested for normality (Shapiro–Wilk test, P > 0.05) and equal variances prior to analysis (Levene’s test, P > 0.05). A t test was used to compare mean growth rates of B. rhodani individuals held at low (5 individuals per enclosure) and high (20 individuals per cage) density. Dietary overlap of Baetis rhodani and Leuctra inermis was assessed using detrended correspondence analysis (DCA) in CANOCO 4.5 (ter Braak & Šmilauer, 2002). Data comprised the percentage contribution of food particle types (diatoms, filamentous greens, coccoid greens, detritus and inorganic debris) in the diet of individual nymphs of each species collected from the benthos (at the start of the experiment) and from the experimental enclosures (at the end of the experimental period). Gut content analysis revealed substantial overlap in the diet of Baetis rhodani and Leuctra inermis (Fig. 1). Individuals of both species, collected from the benthos and experimental enclosures, consumed diatoms, filamentous green algae, coccoid green algae, detritus and inorganic debris of varying proportions. Benthic B. rhodani consumed proportionally more diatoms and coccoid green algae, and less detritus, than L. inermis (Fig. 1). Detrended correspondence analysis (DCA) of gut contents revealed inter-individual variation in the proportions of different food types consumed was greater for B. rhodani than L. inermis, and greater for caged than benthic nymphs of both species (Fig. 2). During the 23-day enclosure experiment, individuals of bivoltine B. rhodani grew an average of 2.29% dry mass day−1, compared to a rate of 0.85% dry mass day−1 for univoltine L. inermis. One-way ANOVA revealed no significant effect of L. inermis density on B. rhodani growth rate (df = 18, F = 0.378, P = 0.770; Fig. 3), whilst a t test revealed that B. rhodani growth rates were similar (df = 9, t = 0.319, P = 0.757) at low and high density. There was no statistically significant difference in growth of L. inermis among the treatments (One-way ANOVA, F = 0.977, P = 0.423). One-way ANOVA revealed no significant difference in biofilm biomass (AFDM per cm2) among treatments (df = 48, F = 0.253, P = 0.955; Fig. 4). Thus, neither B. rhodani nor L. inermis significantly reduced algal abundance in enclosures. We tested the hypothesis that abundant acid-tolerant resident Leuctra inermis could influence the success (growth) of an acid-sensitive recolonist Baetis rhodani, thereby potentially slowing the rate of recovery of mayfly populations via interspecific competition. The results of our enclosure experiment revealed that whilst the two species feed and grow on similar resources, they are unlikely to be in competition for those resources as mature nymphs at ambient densities in these upland streams. Although our data suggest residents are unlikely to influence the rate of invertebrate recolonisation at this stage in their life cycle, more research is required to test for competitive effects acting on early life stages of recolonists (e.g. neonates). In theory, resident species should compete more strongly with, and limit the establishment of, recolonising species that have similar resource requirements (Fargione et al., 2003). Our analysis of diet confirmed a significant degree of resource overlap between Baetis and Leuctra, with both species feeding on biofilm in the benthos and enclosures. Nymphs consumed a range of algae including diatoms and both coccoid and filamentous green algae. Filamentous greens were found in the diet of both species, and although their nutritional value is uncertain (Reynolds, 1992; Junger & Planas, 1993), they could be an important part of the diet, especially in summer months when abundant (Brown, 1961). The occurrence of algae in the diet of L. inermis is somewhat unusual for a genus that is assumed to be dominated by obligate detritivores (see Moog, 1995). Nevertheless, the composition of the diets of the species reported here is consistent with data collected from other streams in the UK (e.g. Ledger & Hildrew, 2005; Lauridsen et al., 2012). We also observed broad overlap in the diet of nymphs in benthos and enclosures, suggesting that any interaction between B. rhodani and L. inermis in the experiment was predicated on realistic resource exploitation, although the lower proportion of detritus in the diet of Leuctra in the enclosures compared with the benthos may suggest either increased consumption of algae or a dearth of particulate detritus in the enclosures possibly caused by the washing of cobbles to remove animals during the setup of the experiment, or limited ingress. Nevertheless, detritus was an important component of the diet of both species, although it was proportionally much more abundant in the diet of Leuctra collected from the benthos. This, together with lower inter-individual variation in diet among Leuctra nymphs, is consistent with contrasting foraging strategies of the two herbivore–detritivores. Baetis can swim actively in search of food-rich algal patches, whereas Leuctra is a slim-bodied crawler likely to have higher patch fidelity. These contrasting strategies of food acquisition could lessen any interspecific competition for shared resources, even at small spatial scales. Resource availability is a key determinant of invasion success in ecosystems recovering from perturbation (Fargione et al., 2003). In streams, herbivorous residents could affect the success of colonists if they exert strong control on algal resource abundance. Many studies have shown that stream invertebrates, including mayflies and stoneflies, reduce algal standing crop and compete for these resources in small streams (e.g. Kohler, 1992; Ledger & Hildrew, 2000b), but we found no evidence for resource depression by either species in this experiment. Weak grazing pressure can be explained by low numerical abundance of consumers, poor match between consumer mouthparts and resource structure, and rates of algal primary production that counteract consumptive losses (e.g. Ledger & Hildrew, 2000a, b). L. inermis are relatively small, generalist, nymphs that may not feed as intensively on biofilms as larger, more specialised consumers (e.g. some caddis, snails). Despite small per capita effects, stonefly nymphs can reach high densities in small stony streams, and they may compensate functionally for the loss of acid-sensitive feeders (Layer et al., 2013). Here we used realistic densities of L. inermis to define the experimental conditions and failed to detect an effect of competition on B. rhodani. Compensatory dynamics have been observed in acid lakes, such that decreases in abundances of acid-sensitive species are coupled to increases in abundance of acid-tolerant functionally similar species (Klug et al., 2000), but the data in streams are equivocal. Our experiment measured the impact of one of the most abundant acid-tolerant herbivores in acid streams, but more research is needed to determine the community-wide consumption of algae by consumers across a range of natural densities. Food quality may also influence invertebrate growth rates in recovering streams and could present a more immediate threat to the success of recolonists than competition (e.g. Townsend et al., 1983; Winterbourn et al., 1992, but see Hogsden et al., 2013). Indeed, in the present investigation, the growth rate of B. rhodani was 2.29% dry mass day−1, lower than values reported elsewhere (Frame, 2010). Low growth rates for Baetis in other Welsh streams have been attributed to the chemically impoverished nature of biofilms in limed streams (Frame, 2010). By contrast, growth of L. inermis was greater than in an acid stream in the Peak District (0.37% DM d−1, Pretty et al., 2005), suggesting a more suitable resource environment for this species. Acidification has had a profound impact on the biota of freshwaters and over recent decades research has documented reduced biodiversity (e.g. Hildrew & Ormerod, 1995; Layer et al., 2013) and marked changes in the relative abundances of species with the decreasing pH (e.g. Townsend et al., 1983). However, far less is known about how these pronounced impacts influence community assembly processes as acidity ameliorates (Ledger & Hildrew, 2005; Layer et al., 2013). We do not yet understand recovery processes in previously acidified streams to know whether biological recovery is limited entirely by only limited abiotic improvement (Kowalik et al., 2007; Ormerod & Durance, 2009; Murphy et al., 2014) or whether altered biota, and feedbacks between abiotic and biotic factors, might delay or divert recovery (Ledger & Hildrew, 2005; Pye et al., 2012), especially in streams. Where abiotic factors constrain biological recovery and biotic factors such as resource availability, competition or predation are trivial, we may expect the empty niches of lost species to be refilled as conditions improve sufficiently to enable re-establishment, and for communities to return to their former state (Sudling et al., 2004). However, where biotic factors intervene, as revealed in recovering lakes (e.g. Keller & Yan, 1998; Holt & Yan, 2003; Vinebrooke et al., 2003; Frost et al., 2006), niches may be filled or modified by residents (Sudling et al., 2004), shifting successional endpoints as acidity declines. Although the research reported here found no evidence for competition as a mechanism limiting biological recovery, we have addressed just one competitive interaction, within the benthic food web, at one point in time. Our experiment was conducted in summer using relatively mature nymphs of both species (medium-sized Baetis and larger Leuctra), and important questions remain regarding the effect of Leuctra (and other taxa) on Baetis earlier in the life cycle. In many cases, the dominant route for Baetis recolonisation is via egg oviposition as winged adults disperse from unpolluted source streams, and thus, any effect of residents on egg hatchlings could have profound implications for the re-establishment of mayfly populations in chemically recovering streams. Although practically difficult to manipulate, neonates of B. rhodani may be more vulnerable to the competitive effect leuctrid (and other) nymphs than the larger nymphs of the summer generation investigated here. Clearly, much remains to be done to explore interactions among the resources, primary consumers and predators that characterise running waters. 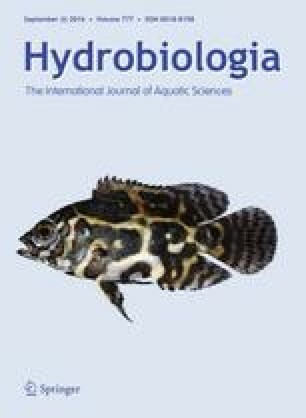 Since a recent meta-analysis suggests biotic resistance in freshwaters may be more frequently driven by consumption rather than competition (Alofs & Jackson, 2014), a key priority for future research is to investigate the role of invertebrate predators in the survival and persistence of recolonising species. It could also be that periods of episodic acidity during high flow represents a more immediate threat to the survival and fitness of many acid-sensitive recolonists (Lepori et al., 2003), but more research is needed to determine whether ecological processes and biotic resistance also influence the rate of recovery following restoration in streams. We thank Dr Fred Slater for providing logistical support and access to the former Llysdinam Field Station, Cardiff University. Funding was provided by the University of Birmingham and The Centre for Ecology and Hydrology. The Forestry Commission and The Wye and Usk Foundation provided access to field sites. The authors have no conflict of interest to declare.